From 2000 to 2015, more than 188,000 phone calls were made to US Poison Control Centers on behalf of children who were exposed to prescription opioids, according to new research. That’s an average of 32 calls a day, or one call every 45 minutes. A new study published in the science journal Pediatrics is sounding the alarm on opioids and the extent to which children have access to these dangerous and powerful painkillers. Research conducted by the Center For Injury and Policy and the Central Ohio Poison Center at Nationwide Children’s Hospital show that, from January 2000 to December 2015, poison control centers in the United States received reports of 188,468 prescription opioid exposures among children under the age of 20. The researchers are calling for changes to the way these drugs are packaged, along with other practical measures to reduce exposure. Addiction to opioids such as codeine, fentanyl, and oxycodone has emerged as a serious health problem in America. These drugs, which work to decrease the perception of pain, are often accompanied by several problematic side-effects, including dependence, sedation, and a strong sense of euphoria. 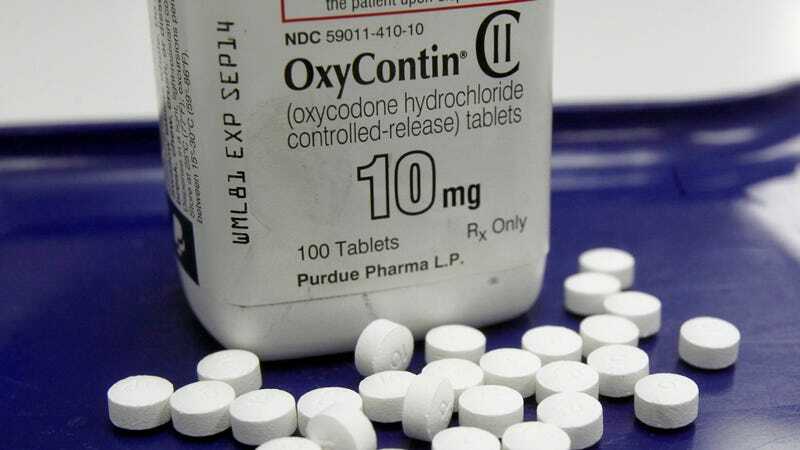 Prescription painkillers are now the leading cause of accidental deaths in the United States, prompting some jurisdictions to declare a public health emergency. But as the new Pediatrics study shows, the problem is even worse than we realize; thousands of kids—either by accident or on purpose—are coming into contact with opioids on a far too frequent basis. For the study, Nationwide Hospital researchers Gary Smith and Marcel Casavant pulled data from the National Poison Data System, which is managed by the American Association of Poison Control Centers (AAPCC). Over the course of the 16 years analyzed, most child-related exposures happened to kids under the age of five (60 percent), followed by teenagers (30 percent), and 6-12 year olds (10 percent) The most common opioids kids came in contact with are hydrocodone at 29 percent, oxycodone at 18 percent, and codeine at 17 percent of exposures. Among children under the age of five, most exposures were accidental, occurring at home. In these cases, the children likely found the drugs while rummaging through the medicine cabinet or other places where the meds are kept. Most incidents were managed without serious complications, but some of these preschoolers required medical attention. It’s a different story for teens. More than two-thirds of exposures were deliberate; either teens were trying to get high off the drugs, or more disturbingly, trying to kill themselves. Over the course of the 16-year study period, the researchers observed a 50 percent increase in the rate of prescription-related suicides among teens. This age group was also more likely to be admitted to a health care facility following exposure (they ingested more pills than kids under the age of five), and exhibited more serious health outcomes than younger children. Approximately 70 percent of teens who use opioids are getting them from friends or family (either knowingly or unknowingly), and not through a doctor’s prescription. The researchers also recommend that prescription opioids be packaged more frequently in blister packs, or single-dose packaging, rather than batches of loose pills in a bottle. They also said physicians need to be more discriminate about handing out prescriptions. The one glimmer of good news the study offers is that exposure to prescription opioids has been decreasing overall, for all age groups of children, since hitting a peak in 2009—except for buprenorphine, which is used to treat heroin addiction. Hopefully, this downward trend will continue into the future as parents get the message about keeping dangerous prescription drugs away from children.